It feel like such a long time since I’ve had communication. We have covered a lot of ground since my last entry. I spend a good part of each day thinking about what to write once I have the opportunity – finally that time is now. The effects of travelling in this part of the world are dramatic in many ways. The “romantic’ idea of trekking in the Himalayas is quickly dispelled after a few days/nights inhaling dust, waking to ice inside your tent, eating canned fish, potatoes or rice, porridge, eggs and tea, tea, tea! Everyone has contacted the Khumbu cough which is a dry hacking number that lives deep in your chest. I’ve had it for a week and now it’s been joined by a sinus infection that has given my nose the same cracked, crusty look as my lips. This is why you are not getting any photos:) At least I have not experienced the unpleasant effects of Accute Mountain Sickness, many in our party have. So far only 1 fellow has had to abandon the race and go back down to Namche. Maybe it’s because I have been here 3 times before and knew what to expect that has saved me from some of the downside others are feeling. This is a tough trip, physically & mentally but we are all focused on getting to race day. I keep visualizing myself crossing the finish line. We will all be relieved when this is done. We are sleeping in Pheriche tonight then climbing up to Lobuche for 2 nights and then Gorak Shep for the night before race day. If you are following on google earth check out these areas. They are freezing, desolate glacial areas on moraine and scree. Why do I love this? Thanks for all your support and comments. There is no greater reward in life than that feeling of finishing what you started. It’s 3:12PM and I need to go find my down jacket. One of the advantages(and possibly the only advantage)of being the only woman making this trip alone is that I get my own room,and when we head up the mountain I will have my own tent as well. That might not sound like a big deal but after you’ve traveled for 33 hours and finally arrive it’s very nice not to have a snoring stranger in the next bed. I know this not from experience,although who would argue the point, but from listening to the conversations at breakfast this morning. As each time zone entered the dining room a comment was shared about the sleeping arrangements. No one is used to having roommates anymore and I admit I’m very happy on my own. To everyone’s credit no one is complaining and that speaks well for how this group will perform once these “shared comforts” are left behind. porters to carry up the mountain & that is not a lot of gear. Anyone thinking of this as a vacation would be surprised to say the least. This morning we are going for a 10k fun run and I’m curious to see where 75 people can take more than 2 steps without being hit by a car, motorcycle, rickshaw or Tonka truck. The signs of new affluence are evident in the increased number of vehicles clogging the dirt roads but no where else. No signs of better housing, healthcare, sanitation, or fewer beggars. The garbage problem is beyond description as is the stench that accompanies it. I have to remind myself that what smells like death to me is life to an entire country. Buddha and Vishnu smile down on these people in their own way. Yesterday while walking through town I saw 2 pigs crossing the river and they were enormous! Way bigger than any of the cars or trucks, or cattle that roam the streets. The river is so filled with garbage that even the mighty swine – standard bearer of filth, looked pathetic in it’s wake. When have I laid it all on the line to make my dream come true? This is a tough one. How to thank so many people who have made the last 7 months the adventure of a lifetime. “We” are going to fill that plane in a few hours! I’m not sure how many seats are on a 777 but I feel like discreetly putting your names on each one. I’m sure my bags are over the weight limit, they are so filled talismans and other symbols of love and safe travel. They are all going with me. Last night Barb sewed colored threads onto the sleeve of my favorite running top w/ each color representing the people and animals closest to me. Such a little thing when you look at it but huge in every other way. Thursday night’s sendoff party was amazing for me. Thank you M-A for organizing such a wonderful time, loved your speech, I love you. Thanks to everyone who came and to those who couldn’t the real party will be when I get back. I have raised over $12,000 through donations to the Everest Marathon Fund! That is just phenomenal. Those of you who donated by check – I have added your names and donation amount to the Giving site. Please take a look. The only snafu so far (I hope) was when I drove up to the bank yesterday to get cash for my trip. I had $15 on me. Imagine my heart rate when I saw the bank was very dark and then realized it was Veteran’s Day and there would be no withdrawal of travel funds for Brent. Once I peeled myself off the roof I began the humbling process of calling for help. It must have looked like the most unlikely of drug deals as I met Mary-Alice, Janet, Barb in parking lots as they handed me wads of cash through the car window. Hey ladies, your checks are in the mail! I have a camera, GoPro wearable video camera, iPhone and iPad so there’s a good chance you will be hearing from me :). I’ll continue these blogs as often as possible and will do my best to make them interesting. I really don’t think that will be a problem though. Have a dream. Set the goal. Prepare. Release. Go! See you on Dec 8. The path has been cleared…. A dear friend just returned from Everest Base Camp last Thursday. 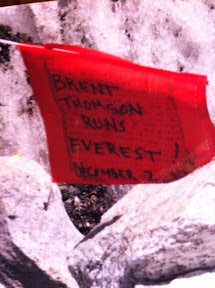 While she was there she wrote “Brent Thomson Runs Everest! December 2, 2011” on a prayer flag and strung it where I will see it as I approach the area where the marathon starts. Just seeing the photo filled me with emotion, I can’t imagine how I’ll feel when I see the real thing. I can see it constantly fluttering in those howling winds, yet I have no doubt it will be there when I arrive. 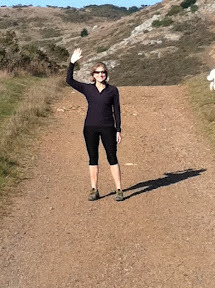 She emailed me along her trek saying she was clearing the trail of obstacles for me. How amazing the power of friendship. I am so grateful for the many friends and colleagues who have so generously donated to the Everest Fund. I have raised over $12,000 so far. That kind of money goes a long way in Nepal. I have all my gear laid out in the guest room. I go in and survey the piles of clothes: fleece, base layers, Gore-tex, wind pants, polypro, lycra, hats, gloves, headlamps, down jacket, Yak-Trax (2 kinds), hiking boots, trail running shoes, gaiters, neck gaiters, socks, sleeping bag, survival sack, GU gels, water bottles, all the toiletries, 2 duffel bags and a small third one for the flight, 12 litre backpack to wear on the marathon, and plenty more believe me. I get overwhelmed and leave the room. But I keep walking past the door and looking in. As overwhelming as all the “stuff” makes me feel there is a certain excitement attached to what’s going on in that room. It represents a different world that I will be soon be in. When I think about the conditions over there it feels so dramatic and romantic. Then I run into one of my colleagues today who say’s “it’ll be just like winter in Minnesota where I grew up” and you know he is right. Frame of reference is everything.